TAKE ACTION NOW! 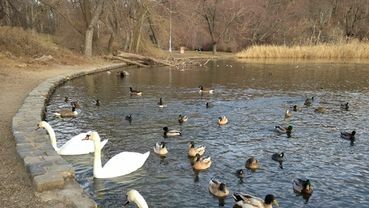 Please Help Save NY's Swans! Killing New York's mute swans and other wildlife is wrong - it is cruel, and not how New Yorkers want our taxpayer dollars spent. 1,188 supporters. Signed and shared. Noted and previously signed. Thank you. Thanks Cal for the link. Signed and noted. Noted, already signed, thanks Cal. This plan is born of extreme ignorance by people who don't know anything about Swans.They are beautiful birds and people get more pleasure out of watching them going about their business.They are no more dangerous than dogs in fact they are safer because they do not roam the streets in packs.Who ever came up with this harebrained scheme should get short shift.Swans are only aggressive when their space is invaded and when they are nesting.This often happens when well meaning people try to approach them in order to hand feed them these people are well meaning but foolish.